I waited a long, long while to find her, but the moment I saw her, I knew she was the one. There was never any question about what I wanted to top our Christmas tree; not a bow or a star or but an angel. That decision was forged by the time I was five, my mother’s DNA pressed into me from the outside in, a small but lasting impression of what you’re supposed to do when you’re grown up. So much of who we become is seeded in early memory, the things we remember, of course, but also the things we don’t even realize we remember. Mama topped our tree with an angel, so, of course, that’s what you were supposed to do. But I was picky. I couldn’t find an angel I liked. For years I settled for a big, colorful bow. Then one day I walked into Belks and I saw her, and the heavens opened amid a chorus of glorious hallelujahs. Or maybe something a little less dramatic. And more quiet. She was absolutely, positively imperfectly perfect. I know I know, she’s as far removed from a Biblical description of an angel as possible, but she represents the one who brought good news 2000 years ago. She’s visual reminder of a spiritual reality. One thing that makes her more special today than when I found her +/- 20 years ago is I cannot find any Madame Alexander angel toppers today. When I searched images (and Amazon), I couldn’t even find another version of her (though, admittedly, I didn’t scroll beyond the first few screens of images). It’s been forever since I’ve hosted any kind of a link-up, and I know it’s a busy time of year where I hope you’re offline more than on, but I’d love to see what tops your tree, and if there’s a story behind it, I hope you’ll share (either by way of a blog comment or even write about it and link a post below. 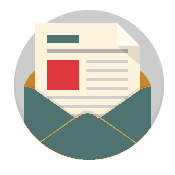 You can also link a Facebook, Instagram or Twitter image). My tree topper is a tiny knit hat. It’s about 3 inches tall, green with a white fuzz ball attached. It was originally an ornament but the yarn loop fell off. I didn’t have a tree topper at the time, so I stuck the hat on “to keep the tree warm”. It’s been there every year since. This year, my big tree is bare and the hat is sitting on my little one. Honestly, even though I grew up with an angel on the tree, I’ve never felt the need to get anything to put up there. Hmmm, I *think* I might’ve used a Santa hat before…that sounds familiar :). I’d love to see your hat, especially because it’s so unusual. I wonder how much of my choice is dictated by having lost my mom when I was 9; surely, that factors in to me. It’s like a way of holding onto her memory or something. Regardless, it’s also funny to me that I was so determined to find the “right” angel. It’s not common for me to be fixated on “one” thing, but I was until I found something I was satisfied with. Every year, I love to bring her out. Growing up we had a “fake” put together tree. I loved it. We put a star on top–not sure why. Now my hubby and I use a “Charlie Brown” tree. Sad to say we have no topper. The tree is perfect for us. It has Jesse tree ornaments and some old hand made ornaments on it. We are usually at the in-laws or he may be working Christmas day! I always want a tree up in my house to remind me of Christmas! Trees fill a room with “happy”–Charlie Brown or Rockefeller :). I searched for YEARS to find a silver star to put on top of my tree. They were all these gaudy gold ones. For awhile I had a big multi-pointed star that I cut one of the points off so I could fit it on top, but I finally found a really nice silver filigree one a few years back. Oh my, Krista–aphids??? I’ve never even thought about a buggy tree! Yikes! THIS will definitely be a Christmas memory for years to come…. Aphids! I’ve got one, too – we used to go to a tree farm & cut down our tree every year (until the proprietor died). One year, all was well, until about 2 weeks in, when I noticed a spider web near the top. W/in a week, the entire top of the tree was “spun silk.” NOT one to destroy Christmas, I took my vacuum w/ the extender wand to it & just vacuumed up all the webs (and the spider, I presume). No more webs! I still haven’t found “my tree topper”. I have a vision in my head of it… and currently have a bow of white sparkling tulle which I really like… but I still am looking for a particular star… I saw once in a magazine and really liked it. I am crafty but this was made of delicate twiny branches and I have seen it in a larger form and a silver metal form… but I have a medium size tree and it would fall over !!! The best I have had so far was a real starfish that a friend got for me. She found it on the beach in Bermuda and was able to bring it home to me despite the fact that it smelled awful. It was way too big for the tree I have now, but I had a bigger place and a bigger tree then. We had to let it dry in the sun for weeks after bleaching it for a few days… and then when it was dry we had to clear coat it about four times. We had to tie it to the top of the tree with some heavy twine which was the same color and everyone loved it… it was a real conversation piece. It was a “real star” that God had created. It had passed away before we got it… we didn’t kill it to get it. But other than my still unfound dream star topper it was the best. I have moved a lot and somehow lost it during one of the moves and even though my tree could not hold it… I miss the star. I miss the memories it holds of simpler times and my boys were just toddlers then… now in their early twenties. Wish I could go back ! Oh, bother – I can’t get my picture thingy to play nice with your linky thingy, so I’ll just talk instead. When it was my hubby’s & my first Christmas coming up, I went to a local “pottery store” – the kind where they make their own pottery, & open up a huge Christmas store in October. 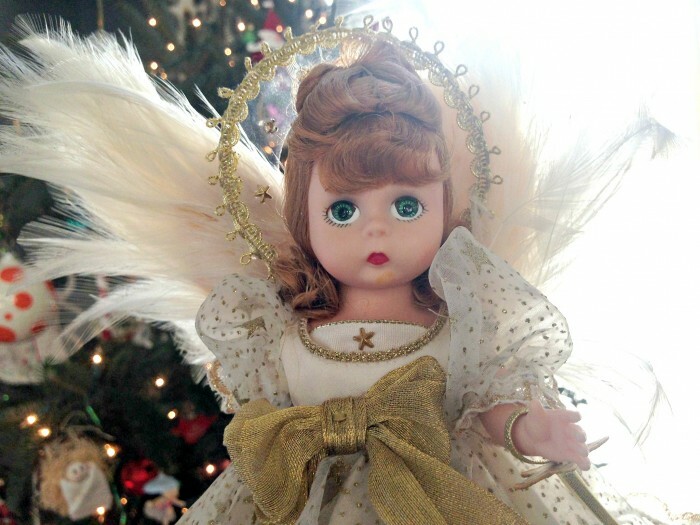 I bought an angel with porcelain hands & face, satin & lace dress & wings, a MASS of curly blonde hair, and a plastic cone with lights all over to sit on top of the tree. 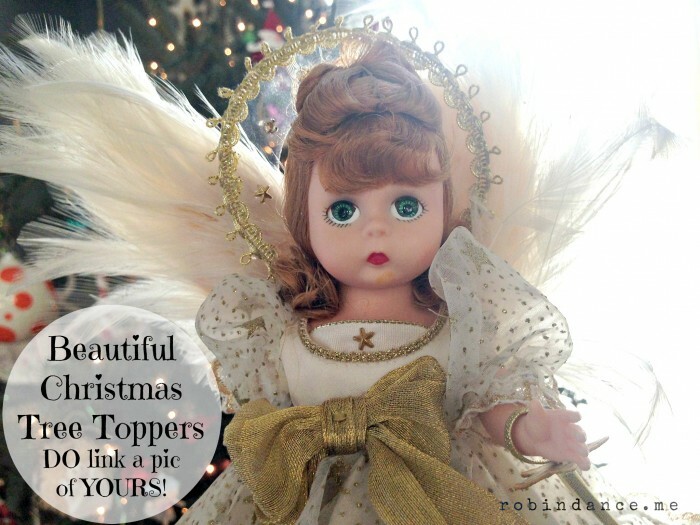 We still have her – every year, my husband puts her on top, and she (usually) leans one way or the other, beaming down on us (I took out the lights immediately – angels don’t need lights). 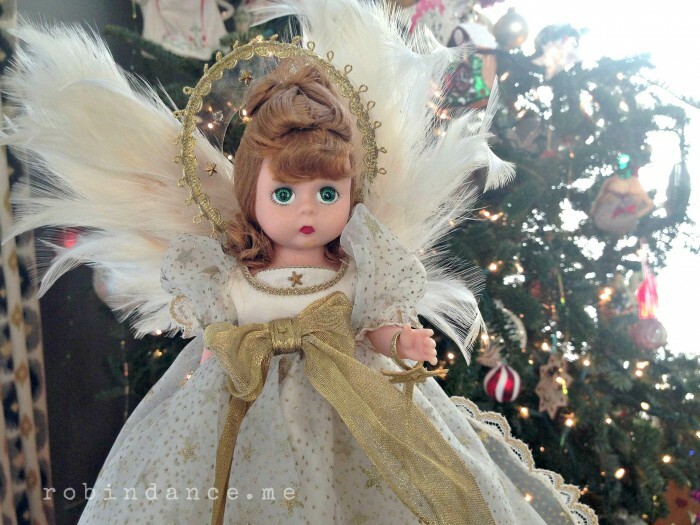 Growing up, we had a cheesy glitter star w/ glass points, so I was determined to have an angel. 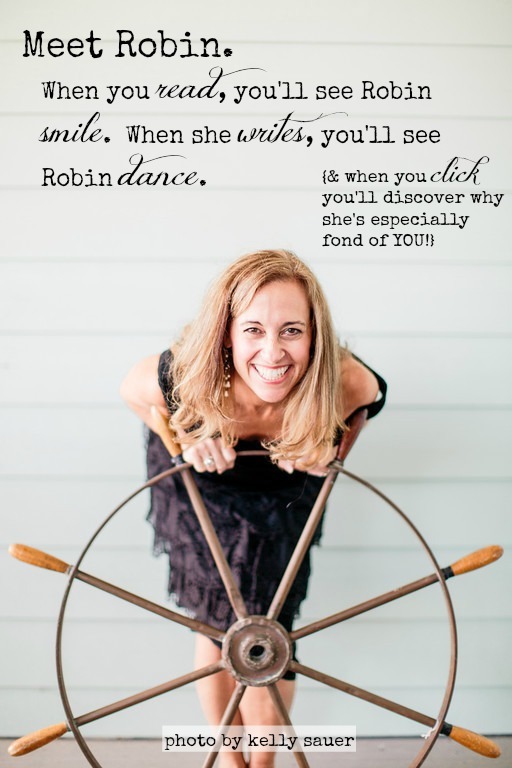 I HOPE that this link here sends you to my facebook picture of her….. It says it’s expired, Elaine :(. We ARE FB friends, so it’s not that; did you remove the image? Is it set to a particular group (“Family” only) or something like that?